A common scenario for where 3 way light switches are used is a light switch at the top and bottom of the stairs controlling one or more lights. The supply wire most commonly used is 14-2 wire which contains three wires a black (hot), white (neutral), and a bare copper ground wire. The electricity will come from the supply wire (wire supplying electric to the light switches and light fixture) to the first 3 way light switch. 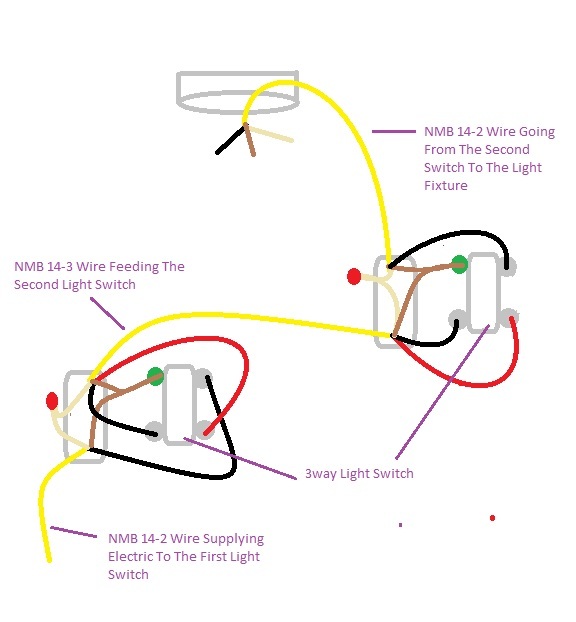 The wire going between the two light switches should be 14-3 (or 12-3 wire where 12 gauge wire is all ready being used) wire, using the red and black wires for the common wires. As shown below the white(neutral) wires get twisted together and capped off with a wire nut. The ground wires(bare copper wire) should be twisted together as well and leave one wire longer then the others to connect it to the ground screw of the light switch. Then a 14-2 wire from the second 3 way light switch going to the light fixture that will carry the power, neutral, and the ground wires to the light fixture. Take the black(hot) wire from the supply and connect it to the first light switch, it will be labeled on the back of the switch as (hot), connect the black(hot) wire there. Take the white(neutral) supply wire, and the white wire from the wires that will go to the second switch, strip the ends of the wires and twist together with a pair of pliers. Install a wire nut to cover the exposed ends. Take the bare copper(ground) wire from the supply, and the bare copper(ground) wire from the wires going to the second switch and twist them together leaving 1 about 2 inches longer than the other.Connect the longer wire to the grounding screw on the first switch. Now at the first switch take the black wire from the wires going to the second switch, label it with a piece of tape(optional but recommended) as a common wire, connect it to the first switch in one of the spots labeled common(or common wires), there will be two of these common connections per switch(connect the wire to either spot). At the first switch take the red wire from the wires going to the second switch, label it as a common wire and connect it to the first switch in the other available common slot. Install the switch in the electric box, now you are ready to move to the second switch. First take the the black common wire coming from the first light switch and connect it to either of the spots on the second light switch where labeled as common. Take the red common wire coming from the first switch and connect it to the other common slot on the second switch. Take the white(neutral) wire coming from the first switch and the white(neutral) wire going to the light(or lights), strip the ends of the wires and twist them together. Then install wire nuts to cover the exposed ends. Take the bare copper(ground) wire coming from the first switch and the bare copper(ground) wire going to the light(or lights)leaving one end two inches longer than the other. Then twist them together and connect the longer end to the ground screw on the second switch. Congratulations If your reading this your all most done. Unless u need to wire the light fixture itself. At this step there should only be one wire left to connect to the switch. Take the black(hot) wire going to the light and connect it to hot Position on the second light switch.